"Talking Sisters" by Jackie Abrams are woven with cotton paper and wire, then coated with several layers of encaustic wax. The forms each represent a visual collection of passions and sorrows, joys and strengths. 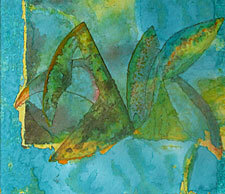 "Glimpse" by Pat Conner is an example of her multi-stage process of creating a painting on watercolor paper using a variety of layered techniques. 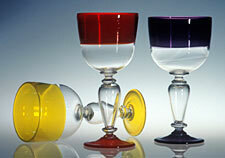 Clear blown-glass goblets by Josh Bernbaum are made with a variety of matching band and foot colors. 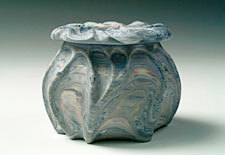 An example of Naomi Lindenfeld's carved, wheel-thrown work in striated clay. Linda Sturgeon's crocheted dress is made with silk and mixed materials. Judy Zemel is offering her stock of chenille scarves at clearance prices since she is turning her creativity to designing printed fabrics. Judy Zemel describes a Cherry Street Artisans Open House as "a joyful wingding -- a classy craft sale with prices for every budget, a café featuring savory soups and astounding desserts, a place to schmooze and hear live music in a lovely Victorian home -- a blending of craft show and party. This was a very happy happening last year, and 2009 looks even more promising!" Cherry Street Artisans began as a conversation during a walk in the woods in the summer of 2008. Teta Hildson and Judy Zemel had been professional artisans for many years and were looking for a new way to sell their work. Teta described a successful open house she and her family had done in Connecticut the previous year. The idea began to quicken, itself an unfolding work of art. Soon, seven more artisans and a gifted cook had become part of the evolution of the vision. This group of people all love fun, good food, excellent craft, and music. The guiding idea for Cherry Street Artisans was to share these treats with friends, family, and community. The resulting Cherry Street Artisans Open House and Café took place on the first weekend of December 2008. The group took a risk on a new idea and decided to be open a rigorous 9 a.m. to 9 p.m. on Saturday. And they decided to keep it homey. The kitchen café was a key element, as well as a more relaxed Saturday evening with live music. At the end of the weekend there was excellent feedback from visitors and artists alike. People loved the diversity of craft, the relaxed and social atmosphere, the excellent food, the sale room, the extended hours. A new tradition was born. This year Cherry Street Artisans will start the festivities during Gallery Walk on Friday, December 4. Exciting new features include the addition of Jackie Abrams, who is nationally and internationally recognized for her fine baskets, fiber creations, and teaching. In addition to her signature work, she will be exhibiting small, fun pieces such as ornaments, cards, and colorful baskets. Returning glassblowers Josh and Marta Bernbaum are expanding their offerings to include jewelry, tumblers, vessels, and ornaments. Pat Conner is continuing to provide the Maple Moose Café's delicious food, and in addition this year she will be exhibiting paintings using unique techniques and colored inks on watercolor paper. New work by returning artisans includes beadwork by Judy Zemel, deep carving in porcelain by Naomi Lindenfeld, Linda Sturgeon's new color improvisations, and earthenware forms by Teta Hilsdon. Jackie Abrams has been making baskets and woven forms for over 30 years. She apprenticed to a traditional maker of white ash baskets in 1975 and exhibited functional baskets at craft shows for a number of years. Eventually her explorations with form and materials led her to redefine the very idea of a basket. Her woven vessels are often made with paper, sometimes incorporating plant materials, strips of fabric, and found objects. She may paint or stain the paper to add rich color. Her pieces are informed and inspired by her years of travel and work in Africa, Australia, and other parts of the world, and have been shown in galleries and museums. For the Cherry Street exhibit Jackie is also offering woven paper ornaments and hand-painted cards. A wide range of her pieces may be seen on her website at www.jackieabrams.com. 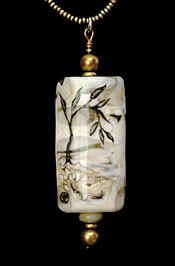 Marta Bernbaum created "Long Life," this handmade glass bead painted with enamel. Pat Conner returns as chef of the Maple Moose Café portion of the festivities, providing the wonderful smells and tastes of the soups, desserts, and other incredible edibles for the café, which in everyday life is Judy Zemel's kitchen. But Pat is bringing something new to the event as well: her luminous paintings, made by layering transparent ink on stretched watercolor paper, and adding monoprinting and pours of bold color. She has just begun to show the work in this area, and is currently featured artist at the Hope Gallery in the Elliot Street Café. Josh and Marta Bernbaum have almost finished construction on their new glass studio in West Brattleboro. For Cherry Street, they will again have their ornaments, which were popular at last year's show, and will offer tumblers and other smaller functional vessels, ideal for gifts. Marta has been experimenting with torch-working techniques which allow her to make detailed, delicate glass forms by melting glass rods with an oxy-propane torch. Through this process she has realized that the form which speaks most powerfully to her is a bead. Thus her Sumi-e bead jewelry series was born. Both Josh and Marta's work may be seen on their website, www.jmbglass.com. Naomi Lindenfeld's functional colored porcelain pieces reflect her love of dance and patterns found in nature. 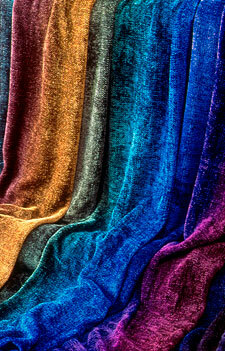 Her flowing, colorful designs have a liquid, tactile quality. Since 1983 she has been refining a technique of staining clay with metallic oxides, then layering, rolling, and sometimes carving the soft clay with various tools. The patterned clay is hand-built into vases, mugs, bowls, lamps, butter dishes, platters, and other items. Her latest work involves wheel throwing and deeply carving thick pieces of the colored clay to reveal rhythmic, mesmerizing striations of color through each piece, giving it added dimension. Images of her pottery can be seen at www.naomilindenfeld.com. Linda Sturgeon, who makes contemporary crocheted clothing, began playing with fabric as a child, making costumes for herself, her dolls, and her pets. She sewed her own clothes as a teenager, sometimes cutting freehand without a pattern and using unconventional materials like upholstery fabric. In 1971 Sturgeon started making and selling crocheted bags inspired by Asian and Mexican baskets and European shopping bags. She soon returned to making clothing, creating a crocheted fabric by bundling together yarns of different fibers and colors. 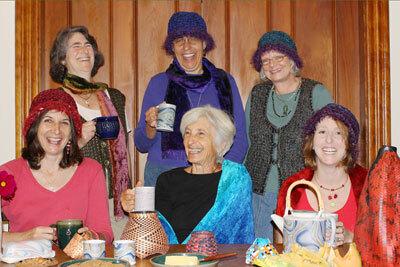 "When I get it right, the yarns sing to me," she says. "The harmony of the blended colors; the dull, nubby texture of raw silk combined with loopy rayon and satiny bamboo fiber yarn, with a single strand of linen running through the mix -- it's like a musical chord." 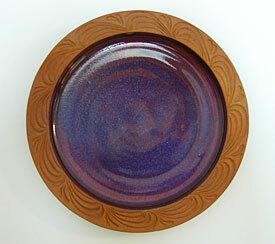 The rich blue and purple of this platter by Teta Hilsdon contrast dramatically with its carved, unglazed edge. 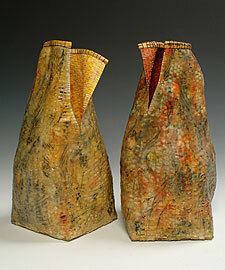 Teta Hilsdon works with high-fired stoneware thrown on the wheel. Hailing from a family of craftswomen and engineers, she is attracted to functional art. "I look to the elemental grace of a clay curve as the most beautiful thing. Then I look for a design that enhances the function of the piece." She will have a variety of carved and decorated bowls and mugs in strong, earthy colors. A co-founder of the Brattleboro Clayworks in 1983, Hilsdon now does pottery "on the side" while working as an administrator at the Brattleboro Museum and Art Center. Eileen Hilsdon, Teta's mother, inspired her because she was always making things: sewing, making music, crocheting -- and still, in her eighties, gets excited about new quilting patterns that she can't wait to try out. Eileen will have her quilted items for sale at Cherry Street. Judy Zemel has been known for her sensuous woven chenille clothing for over 20 years, but she has a new enthusiasm: putting her wit and insight into printed, painted cotton and silk pieces. She screenprints and dye-paints flowers, graphic designs, and even political commentary onto cotton clothing, kerchiefs, and homewares. She also has begun to make jewelry with delicate glass beads -- another way to manifest her incredible sense of color. She will have her remaining inventory of chenille scarves and shawls available in the Cherry Street sale room, which will feature reduced price work from all artists. Cherry Street Artisans' 2nd Annual Open House and Café is at 44 Cherry Street in Brattleboro (take Canal to Maple to Cherry) on Friday, Dec. 4, 5:30-8:30 p.m.; Saturday, Dec. 5, 9 to 9; and Sunday, Dec. 6, 11 to 4. Maple Moose Café offers fine food and desserts, and folks are invited to sing, bring instruments, or listen to the music on Saturday from 5 to 9. Admission is free. For more information call Judy at 802-254-3530 or email Naomi at naomilin@sover.net.